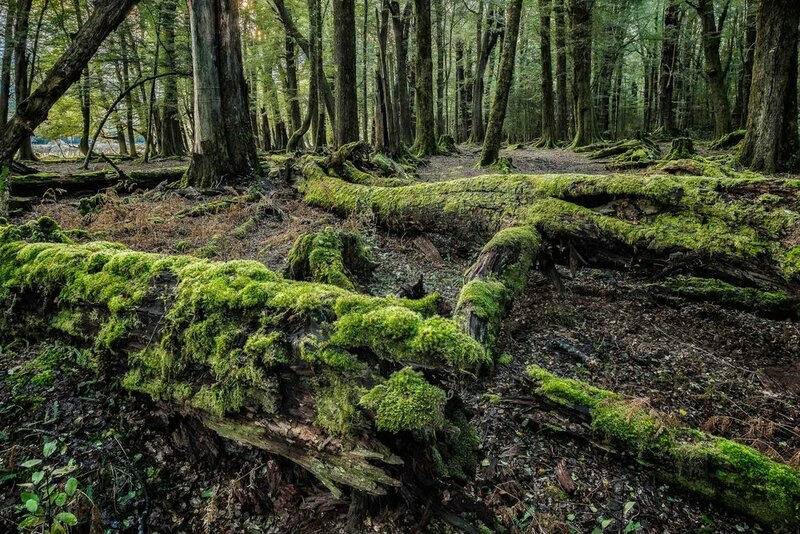 Moss covered trees lie strewn across the forest floor at Paradise in New Zealand. I was so happy to visit Paradise, a relatively remote forested area on the South Island of New Zealand. I first became aware of the location while researching some of the locations used in the filming of the classic motion picture film The Lord of the Rings, The Fellowship of the Ring. Paradise, at least in this case, is not so much a specific site, but an area. The road doesn't so much take you to or through paradise, but alongside it. Once there it really is a matter of getting out of the car and walking into the forest to see what awaits you. Now try to tell me that's not a metaphor for life, particularly for the intrepid traveller in us all. The fact that the above image was made only about 100 meters from the car demonstrates the beauty that exists within the tree lined walls of the forested area known as Paradise. The first thing you notice when entering a forest is light. Once you pass the veil that separates the brighter outer world, and cross into the forest proper, your eyes open to adapt to the darker conditions. Suddenly, what appears as an impenetrable wall of darkness from the roadside is revealed as a world of light and color. At first the forest appears much brighter than expected. Then, as the cones in your eye's kick in, a world of green is revealed. It's a little like when Toto pulled back the curtain and exposed the wizard for what he really was. Wow, would you look at that? As I write I'm wondering about how time seems to move more slowly within the borders of a forest. Perhaps there's some deep collective memory from our primal past, when dinosaurs roamed. I remember being attracted to the mosses that carpeted the fallen trees. It's as if they foretell our own, inevitable demise. It seems to me that such metaphors of decay strike deep within our psyche. Maybe that's why this kind of subject matter connects with us on such a profound level. While the green of the forest was beautiful and so very peaceful it’s also a little scary being in such an enclosed environment, on your own, for an extended period of time.